Supernova's country style galley is an excellent place for gathering and watching the chef prepare your next course. She boasts a full-beam master, just forward of mid-ships and 3 other staterooms (2 aft and a VIP all the way forward) this layout allows 8 guests to sleep comfortably in private on-suite staterooms. Her raised pilot house allows the Captain to navigate during those unforeseen weather days. An additional helm station on the flybridge offers the Captain to navigate those beautiful days on the banks of the Bahamas while talking with the guests about their next anchorage. United Yacht Sales New Jersey would love to guide you through a personal showing of this 100' Hatteras Motor Yacht 2003. 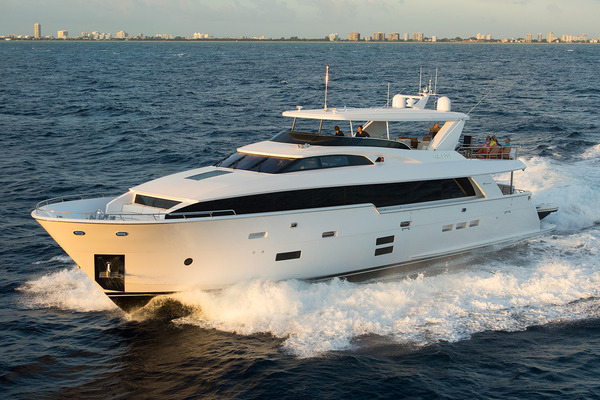 This yacht for sale is located in Ft Lauderdale, Florida and priced at $3,750,000. For a showing please contact us by filling out the form on this page and we will get back to you shortly!